Noah Snyder ’10 likes to contemplate the wonders of the modern world but not in the usual sense. Since graduating from Allegheny, here are some of the subjects he’s been thinking about: How to prevent scar tissue from forming on electrodes implanted in patients’ brains. Deterring bacteria from forming and multiplying on dental implants. Keeping barnacles from attaching to the hulls of boats. Making sure industrial heat exchangers and cooling systems don’t foul and clog. You have to admit those topics cover a lot of intellectual and creative ground. Snyder appreciates a good challenge, and one of the first ones he came upon as a graduate student at the University of Pittsburgh was: How does one solve the problem of treating and maintaining electrodes so they transmit clear signals from inside a brain to the bedside monitors? That challenge led Snyder to earn his doctorate, win more than $150,000 in Big Idea competitions, be included in the Forbes’ 30 Under 30 ranking of young innovators, and co-found a company, Interphase Materials, based in Pittsburgh. What is the actual product/service that you deliver to clients? 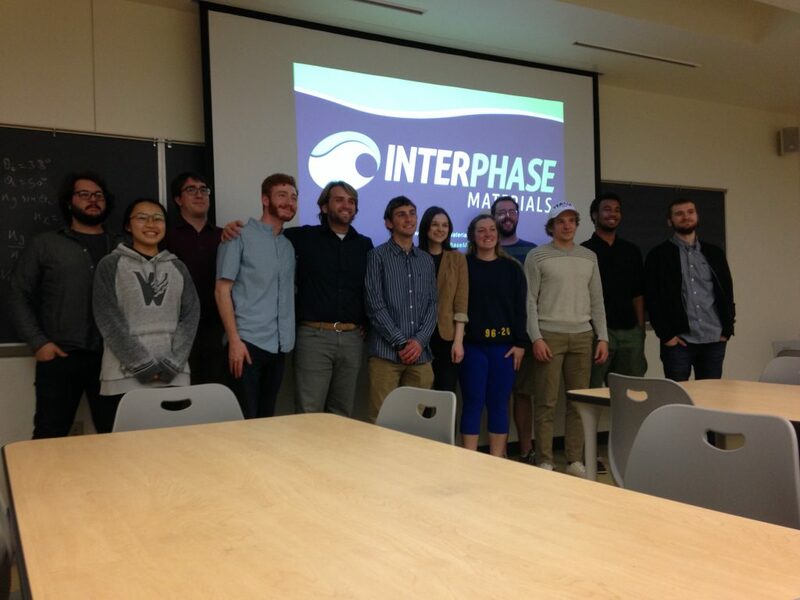 Interphase Materials operates as a solution-based company to improve the efficiency of cooling systems for power plants, building facilities, data centers, refineries, etc. We create custom advanced-material systems designed to work specifically based on the customers’ needs that may be applied directly on-site or onto individual components shipped to our facility in Pittsburgh. One of the key benefits of our technology is that it can be applied at an operating facility without shutting the plant down. Our system is designed to flush in water and create a single-molecule layer on the surface of tubes, pipes, or other components to improve heat transfer and prevent fouling. In layman’s terms, what does your product do? Staying cool is incredibly important. The overall efficiency of a power plant is directly affected by how effectively the cooling system can condense steam to feed back into the boiler system. Improvements in 1 percent to this system can save a power plant $600,000 each year and reduce the CO2 output by 40,000 tons. Likewise, almost a third of a building’s utility bill is spent on the chiller designed to provide cool air to the facility. In each of these cases, the cooling system efficiency is decreased by biological fouling in the tubes and pipes and a decrease in heat transfer performance of the system. Our technology creates a molecularly thin layer on the surface of tubes to improve the thermal efficiency of the system and prevent build-up of fouling. With our Heat Transfer Enhancement System, we can improve the efficiency of a system by 5 to 10 percent resulting in both economic and environmental returns. Did you patent the product? Yes. We patented the original technology that was developed while we were completing our PhD at the University of Pittsburgh. The original technology was developed for brain implants and other medical devices but since has been adapted for industrial applications. We are also working on patenting on additional technology we have developed since then. You were the sole employee of your company – how big is it now? Currently we have five employees and several part-time contractors. We also have a full team of advisors who we work with to continue the company. One of the most rewarding aspects of creating a company has been the fact that we have created five paying jobs in the region and we will hiring more soon. What aspects of your Allegheny education helped you navigate graduate school and then start a company? One of the most important influences of my career was the diverse education I was exposed to at Allegheny College. While at Allegheny I majored in biochemistry and neuroscience and minored in physics and Chinese Studies. Being exposed to such a wide range of disciplines gave me a new perspective on my coursework and business. Whenever I come across biochemistry problems, I think like a physicist; and whenever I am trying to solve a physics or chemistry problem, I look to how biology and nature has solved the problem before. Having that diverse background helped distinguish me in grad school and ultimately led me to my career staring a company. Doros Petasis, my thesis advisor at Allegheny, used to always talk about how breakthroughs always came from great minds that were able to connect two seemingly unconnected disciplines. Fast forward about seven years and now we are changing the way we create safe materials for power plants based on technology we had developed for brain implants … talk about unconnected! You are an articulate and entertaining speaker – did you hone that skill at Allegheny? Communicating is 95 percent of what I do, more specifically, sales is 95 percent of what I do. However, not just sales in the traditional sense of talking to customers. When you start a business, you are constantly selling yourself and your ideas. Recruiting is all about selling your ideas to potential new team members, raising investment money is dependent on persuading investors to believe in you and your team, and once you have a great team and money it takes a great deal of motivation to keep everything moving in the right direction. One of the things I remember about Allegheny was the focus on presenting and writing, especially through the FS coursework. These courses are really important in starting to communicate your ideas to your peers and to learn the art of public speaking. It doesn’t matter how good your ideas are, if you can’t communicate them, they will just stay tucked away in your mind. What advice do you have for undergrads interested in either bioengineering or becoming entrepreneurs? Get involved and do stuff! Bioengineering is an interdisciplinary field of study. My focus in graduate school was on brain-machine interface technology and required a background in biochemistry, neuroscience, physics, and electronics (which is what attracted me to the field initially). The more you can learn, the more you can enable yourself to pick up different disciplines as you go. Being involved is incredibly important for becoming an entrepreneur as well. As I mentioned before, being able to connect the seemingly unconnected is where innovation comes from, and to do that … you need to have a wide web of fundamental understanding. Also being a diverse individual with lots of different experiences is important in entrepreneurship as well. At the end of the day, business is all about connecting with people, and the best way to connect with people is through stories! Every day the success of your business might be dictated by your relationship with a lawyer, a sales technician, a facility manager, a boat owner … frankly some random individual you would have never thought could impact your business! Being able to tell a story that helps you relate to people might just be what it takes to recruit a talented employee or make a sale. I can’t tell you how many times I’ve retold stories from my trip to China during the Experiential Learning Seminar I took at Allegheny in 2009. I have a simply philosophy and it’s to treat everyone you meet with the same respect you would show a potential investor or customer, whether it’s a security guard or the CEO of a fortune 500. At the end of the day, I think that type of attitude will get you far in life. Money is important, but social currency is invaluable. You are married to an Allegheny alumna. My wife, Lindsey Snyder (McClement, Class of ’10) and I met at Allegheny College in FS Neuro 201! We both attended the University of Pittsburgh for graduate school and she will be graduating with her PhD in neuroscience this summer. She’s an incredibly smart and passionate person. Starting a business is difficult but starting a business without a supportive and understanding partner in life is impossible, and I wouldn’t have been able to accomplish any of this without her. She’s also been very engaged with the entrepreneurial world and has worked to perform technical due diligence on investment deals, been involved with technology commercialization at the University, and after graduation she will be working with companies and investors to build and grow young companies in the life science industry. No children yet!